Dharamsala: It was a momentous day for the Tibetan Children’s Village School in Dharamsala as it hosted a talk entitled, “Freedom Through Forgiveness,” by the man who His Holiness, the Dalai Lama considers “not only his friend but also his hero.” It was also a very memorable occasion for all, that a man left totally blind by another person shared a common dais in an exemplary spirit of forgiveness and reconciliation. 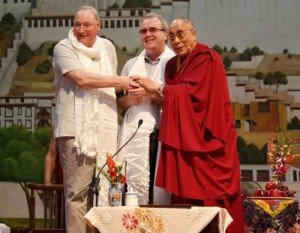 His Holiness created this special occasion, a community celebration as it were, for the Tibetan children, though Mr. Moore and Mr. Inness had only sought a private audience. 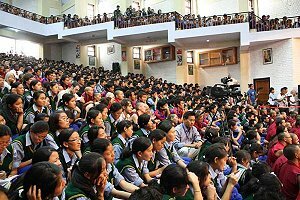 His Holiness the Dalai Lama ushered Mr. Richard Moore, a blind Irish gentleman and Mr. Charles Inness, a former British soldier, into the TCV school auditorium in Mcleodganj near Dharmshala with thunderous applause by over 2,500 school children and other participants. Mr. Charles Inness, Mr. Richard Moore and His Holiness, the Dalai Lama Richard, at the age of 10, was hit on the face by a rubber bullet fired by Charles, a British soldier, when he was walking home from Rosemount Primary School in Derry in Northern Ireland with his friends on May 4, 1972. “Every thing went blank,” he said later when he woke up on the school canteen table. In an extraordinary turn of events, on January 14, 2006, Richard flew to Edinburgh to meet Charles, who had gone into deep shock and sadness after learning about what happened. Charles explained that he had shot the bullet to get stone throwers away. 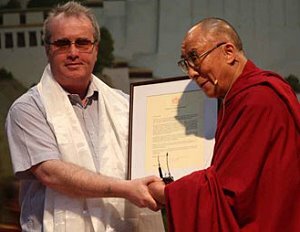 His Holiness honoured Richard with a citation for showing a true practice of forgiveness and compassion as a wonderful model to follow for the six billion people in this world. His Holiness also lauded Richard for his works to help vulnerable children around the world through his charity, Children of Crossfire. “Despite facing the unimaginable tragic and horrific experience, Richard has made a very successful life and I am very honoured and privileged to have him as a great friend for the rest of my life,” Charles said.